Paradigm's SUB1 is the smaller, more affordable version of the HCC award-winning Paradigm SUB2, although at £5,000 (rather than £7,250) it's still not pocket money. The SUB2 is so large and heavy that it became simpler for me to travel down to the Bristol Hi-FI show to test it – after all, it did pack six 10-inch drivers into its cabinet and 4,500W of amplification. This time, I made sure I got to play with the more manageable SUB1 in my listening room. 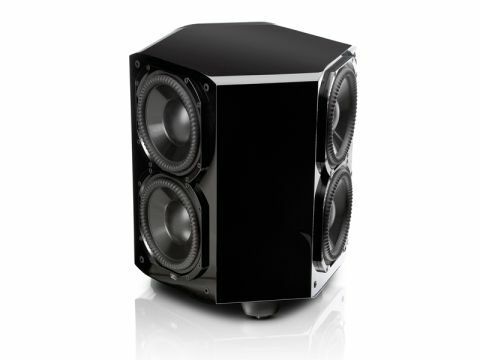 With 'just' 8-inch drivers, albeit a small herd of them on a monstrously efficient and high power Ultra-Class-D amplifier of nearly 2,000W, the SUB1 is a cute clone of the Hexagonal Hell that its big brother embodies. It's still heavier than an average man-eating catfish (49.4kg, or 109lbs in old money) but is so very compact, it can take up no more room than some perfectly ordinary woofers of no more than one tenth the cost. So what's so special? Well, for one, those drivers are ridiculously clever – huge magnets, wide Aluminium voice coils, fully four layers deep, wound around magical Nomex formers. Meanwhile, the top surrounds are like a non-kink shower hose, or goose-neck microphone stand, so won't distort or collapse, due to their ribs. Mr. Paradigm UK helped with the install in my room, armed with the brand's PBK (Perfect Bass Kit) which SUB1 owners get as part of the package. We waited while a +/-1dB calibrated microphone listened to the room at ear level and fed data to a laptop. The resulting performance was amazing. It was as if an audio expert with a real-time analyzer and some serious time had hand-tuned the entire room. I revelled in that oh-so-hard-to-describe joy of bass that is seamless with the rest. Tight, snug and enveloping, with all the cinematic edge and tension, but without any woofly room overlay. The final part of the Bourne trilogy – well made but a bit tedious with all the flashbacks, if you ask me – was the chosen Blu-ray. There's a lot of use of deep throbs in the LFE feed to create tension as well as the de rigueur use of explosions and gunplay. It was exqusite. The SUB1 proved equally delicious with music. It offered polite aplomb and a lovely underpinning effect to tighten up the rest of a stereo sound stage – in this case supplied by a Canton Vento system on test at the time. And all while holding its own melodic grip. I did hear the 8-inch drivers struggle a little to get that flat bass response curve, to cope with the huge 50Hz to 80Hz suckout in my room at high levels. Thus, I doubt the value of using the PBK1 on lesser woofers. But that's the most minor of gripes and more the fault of my own room than the SUB1. In fact, I have no hesitation in recommending Paradigm's product to anyone hunting for a top-flight woofer. Especially if they like a bit of style to go with their substance.